Sometimes the food gods leave and you’re left with an empty soul; endless nights of takeout and a heavy reliance of going back to your tried and true recipes….every single night. True I have excuses, and pretty good ones at that. There was a house move, a wedding, a honeymoon, a million house remodeling projects (currently happening, yay! ), and a kindergartener (about to happen….eeeekkkkk!). Routine has been fleeting. Stability has been non-existent. Good news is these are all great things happening. I mean like whoa, big, great-news, things. I’m just sad my food inspiration gods have left me. It’s hard to come home and feel inspired when you need to come home and clean up after the electrician and window installation guys. It’s easier to stop off at The Habit (which is conveniently located next to The Home Depot- our second home as of late). I’m really trying, I am. I wander through the aisles at the grocery store like a lost puppy, waiting to hear that whistle and call to “come here girl, come here” but alas the call never comes. I wander and relent. But this is all changed recently. Thursdays are usually left to the hubs to stop off at the local farmers market, but he was on set so I decide to use my lunch break and walk to the smaller one next to my work instead. I invite my office mate and let her know that I am seeking dinner inspiration. This is serious. And then I spot this beauty. 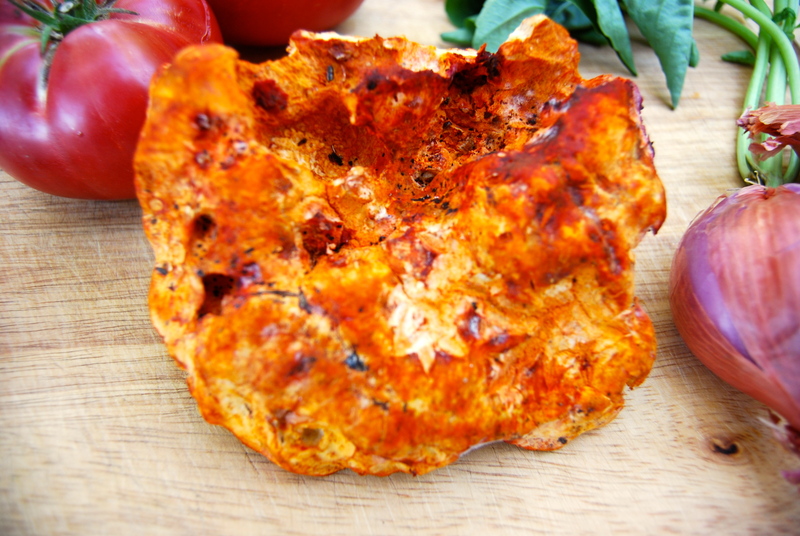 I have heard of this lobster mushroom, probably even eaten it once or twice….but never cooked or purchased it. I am pulled in like a fish chasing a lure. The earthly sweet aroma is intoxicating. I’m hook, line, and sinker; my gods have arrived and I’m not losing them. As I’m handing the merchant my precious 7 dollars to buy this beauty I’m explaining to him how I’m going to cook it, which is a surprise to me since I didn’t realize I had a plan yet. He thought the flavors would go well together and smiled. I was probably grinning like an idiot. I was off to pick up some of the most beautiful heirloom tomatoes I have yet to see this summer and then back to the office to sit in anticipation until I could go home and play. And play I did. This sauce is wonderful. Simple yet refined. It’s basically a vodka sauce substituted with white wine, and instead of using canned tomatoes I grated fresh heirloom tomatoes and used those instead. I read about this technique on Food 52 , the only difference is I didn’t seed my tomatoes before grating them, I just strained the sauce at the end. You could go more of a rustic route and not strain the sauce, for me, I think memories of the French Laundry were still clouding my head and I was seeking that touch of refinement. In a medium sauté-pan or saucepan heat the butter and olive oil over a medium heat and add the shallot and garlic. Apply a touch of salt and pepper and sauté for about 5-7 minutes, or until just turning golden in color. Add the white wine and bring to a boil, reduce and simmer until reduced by half, about 10 minutes. 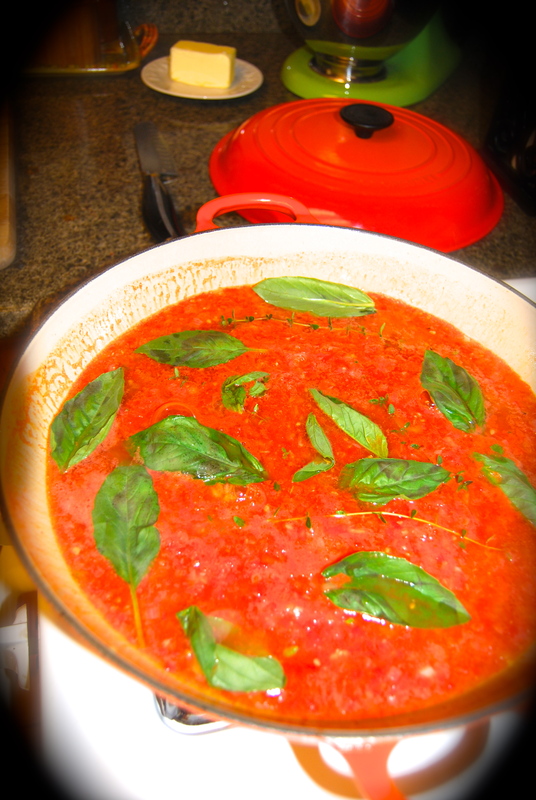 Place the grated tomatoes, basil leaves, thyme, and a touch more salt and pepper. Bring to a boil, reduce, and simmer for 30 minutes. Drain the sauce through a sieve and be sure to take some time to really push through with a wooden spoon to get all of the delicious juices through (draining the sauce is totally optional, you could go more of a rustic route here if you please). Place the sauce back on the heat and bring to a light simmer, then add the heavy cream. Lightly stir until it is all blended and unified, then taste for seasoning. You can cover and keep on the lowest heat setting to stay warm until it’s ready to use. Bring a large pot of water to a boil, salt, and add the pasta. Cook to just under al dente. In a sauté pan add the garlic, butter, oil, and thyme, and let sit on a low heat for 5-10 minutes so all of the flavors can infuse. 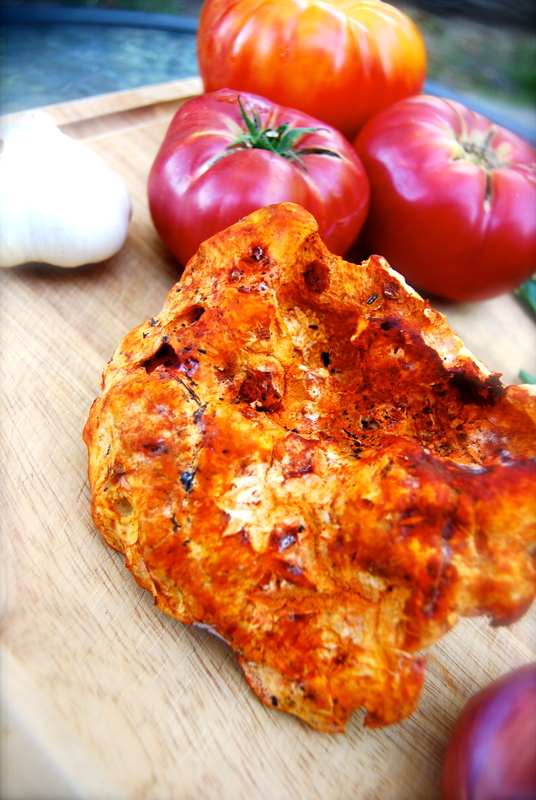 When ready to cook the mushrooms, bring up to a medium-high heat. Add the mushrooms and sauté for 5-10 minutes, taste to make sure they are cooked to your liking, then add salt and pepper to taste. 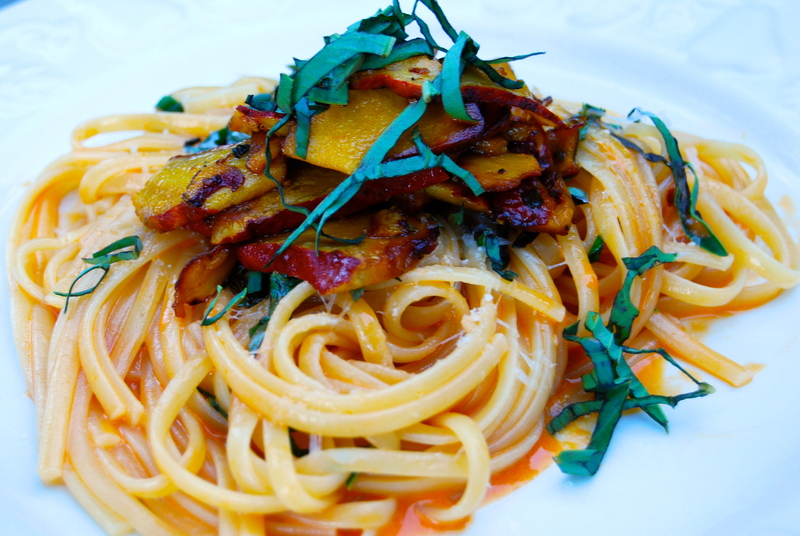 When the pasta is just under al dente drain and place in the heirloom tomato sauce. Add a heaping of freshly grated parmesan cheese and mix everything together. Bring the sauce up to a medium heat and finish cooking the pasta in the sauce. 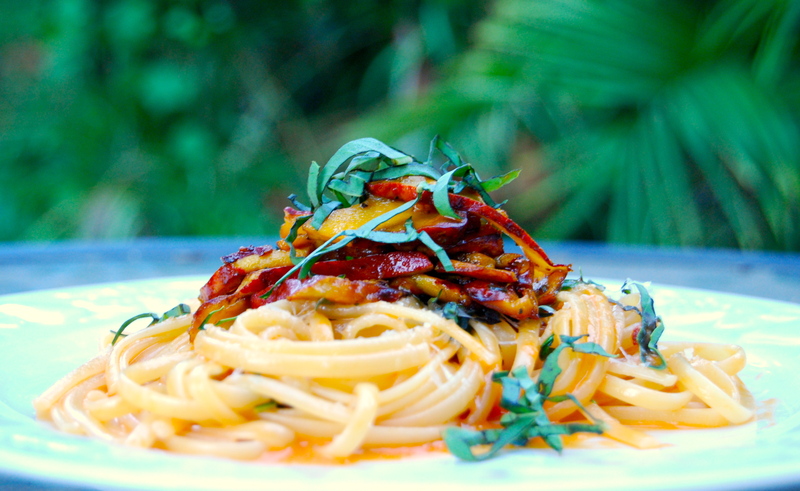 When ready to serve, mix in the basil leaves with the pasta, saving a little to garnish. Plate your pasta and add a little more cheese on top (or a lot more if you are like me) then add the wonderful lobster mushrooms and garnish with basil. Looks delish! Lobsters are one of my favorite mushrooms. I’ve been hunting mushrooms for decades, and that’s one of the few I’ve never actually found. (It’s an interesting mushroom — it actually begins as an inedible russula mushroom, but then another fungus attacks it and turns it into an edible lobster mushroom!) Would love to hear what you thought of the Laundry! Yeah! I spent about an hour reading about them once I bought it since I really didn’t know much about them, totally fascinating! Mushroom hunting sounds dangerous! I would be terrified of picking something incorrectly, I’ll leave it up to you and the pros 😉 Post for the Laundry is in the works, it’s daunting as hell to write about one of my idols…it will most likely be more of a post focused on pictures haha. It was incredible though, worth every penny. Can’t wait to read about it! Mushroom hunting isn’t quite as daunting as it sounds, if you’re careful. We get beautiful chanterelles here in the Santa Monica Mountains in the spring. Love all the colorful foods in your pictures! This sounds so mouthwatering! The dish looks delicious! Thank you! It was fun experimenting with the mushroom, but the sauce was my favorite part!! This looks amazing. 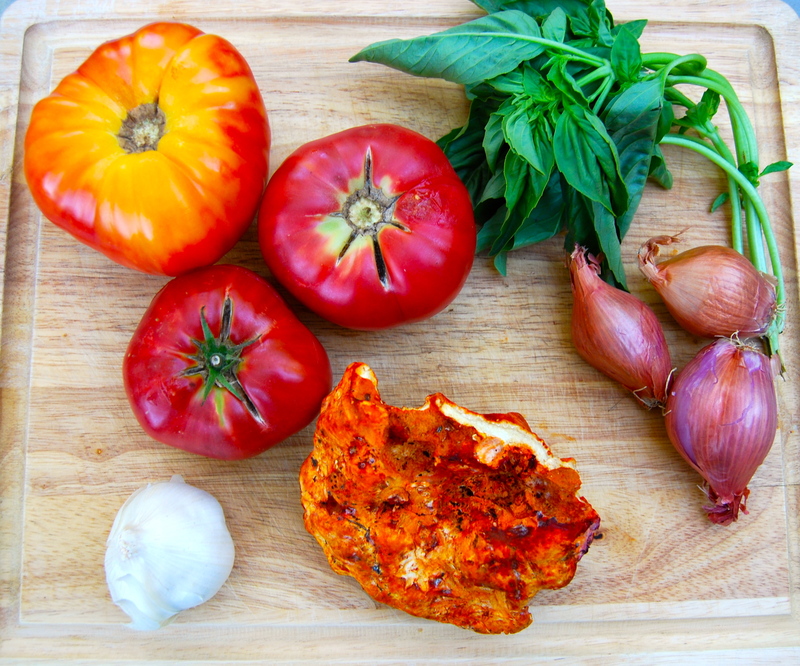 I’m looking for a good heirloom tomato sauce recipe for some beautiful tomatoes I grew! This looks so tasty. Your pics are awesome! Thank you so much!! I hope by next summer to have my own home grown heirlooms…..were they hard to grow yourself?